In our home in Colaba, the five day Ganapati utsav (festival) is the biggest family event of the year. Our entire joint family comes together making it very festive. For our daily flower decorations, one of us goes to the Dadar Flower Market every morning to buy flowers. After bringing them home, the women gather together and weave them into spectacular garlands and various other decorations. 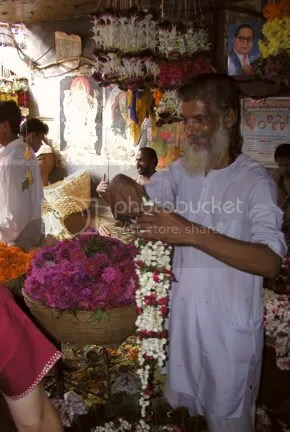 September 2002 was the last time I was home for Ganapati and one morning, I volunteered to go with my sister-in-law to the flower market. 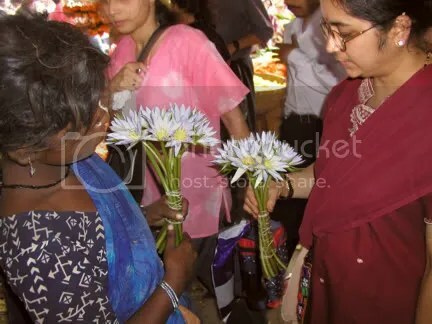 We took the train from Churchgate to Dadar and the flowers sellers are camped right outside the station under the bridge and packed into the nearby alleys. I mean, jam- packed – you move sideways leading with your shoulder, smile and squeeze your way forward. There are flowers everywhere. Marigolds heaped on tarpaulins on the ground and sold by weight, champae in tiny baskets and sold by the number and delicately wrapped in broad leaves, the dazzling array of long streamers, as well as the colour co-ordinated gajras of mesmerizing blooms, the cacophony of the sellers and buyers screaming and jostling all contributed to a spectacular audio visual symphony. It was an exquisitely delightful experience, one that I am sure to revisit in the near future. More than the colorful flowers, the smiles on the flower sellers stayed in my mind. 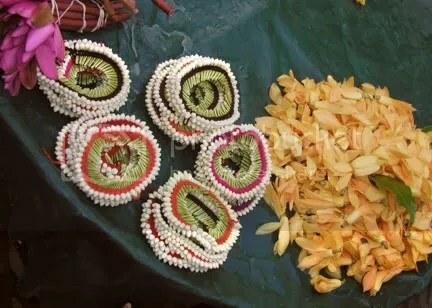 From the woman sitting cross-legged on the ground weaving busily, to the young men weighing the flowers, the older gentleman convincing you to buy the garlands, to the young lady with matted hair selling fragrant lotuses – they all had beaming smiles on their faces. They probably had to wakeup very, very early in the morning to be in a choice location to sell the flowers here (we got there around 7:00 am). Their sales probably determined what they ate for dinner, or if they went hungry. I would cringe whenever my sister-in-law bargained for a few rupees. I would nudge her, “just give her the money!” Many a times it appeared that their whole life belongings were right there in that little jholi by their feet, yet their grace and joy with the world came through loud and clear. 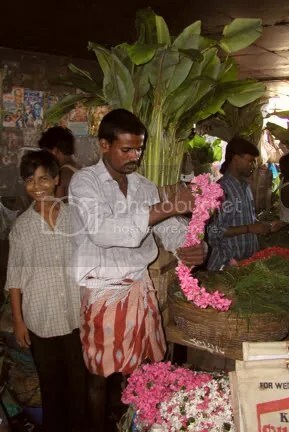 Whenever I complain about silly things, I think of these flower sellers and see how fortunate I am to have so much. Why then do I complain? 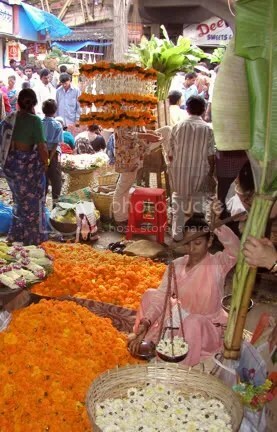 Maybe more people in the world need to see these flower sellers and derive inspiration for their own lives. It is not how much wealth you have, it is your attitude towards life. Hi this is SriKrishna, I was born in Mumbai and due to my father’s transfer to South. 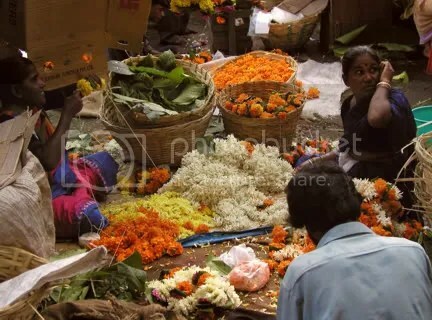 I was broughtup in South india, but I never forgot the fragrance of that phool market in Mumbai. 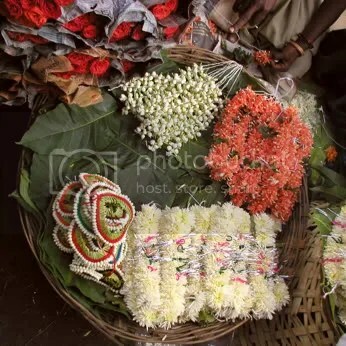 We used to live in Dadar, opposite to phool market………….. I was rationalizing on this subject last evening and I resolved to search the WWW for more info. Your blog came up in my research and I’m impress what you have penned on this topic. As I’m currently broadening my research and thus cannot add further, however, I’ve bookmarked it and will be returning to further comment. Like I said, love this comment and will be back before long.